The older you get, the more likely you are to experience a significant injury or accident. As your body ages, so does your mind. Thus, decreased coordination, balance issues, and declining mental acuity can make it more likely for you to be injured. 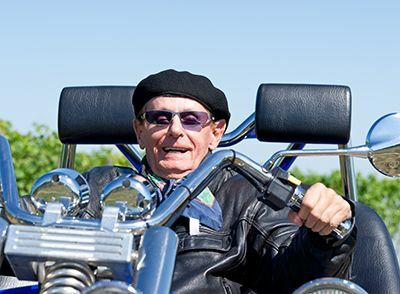 Whether you are riding a motorcycle or doing yard work, the older you get – the more likely you are to get hurt, and that means that baby boomers taking unnecessary risks need to exercise extra caution to avoid personal injury. Specifically, a new group of enthusiasts, who consists of older, more affluent riders, has increased the numbers. Older motorcyclists currently account for more than half of all motorcycle fatalities. In 2012, 56% of motorcyclists killed in crashes were older than the age of 40, yet in 2003, that number was just 46%. Conversely, fatalities among younger motorcyclists have actually decreased. The increase in accidents for older motorcyclists may be related to vision and reaction times, as well as the larger bikes older riders favor, which are prone to rolling over more often. Older men and women are also more likely to be injured in a fall – especially when using ladders. One out of three people over the age of 65 fall each year. Annually, more than 258,000 fractured hips occur in patients over the age of 65 and 95% of those are caused by falls. To reduce your risk of injury, get adequate calcium and vitamin D and be sure to exercise frequently to improve your coordination and balance. If you must get on a ladder, always have someone nearby in case you fall. There are more than 33 million licensed drivers over the age of 65. Per mile traveled, fatal crash rates increase starting at age 75 due to increased susceptibility to injury and medical complications. More than 5,500 elderly drivers are killed each year in car accidents, and another 183,000 injured. After age 75, the rate of fatal car accidents skyrockets to 3 deaths per 100 million miles driven – in other words, older drivers are as bad as teenage drivers. As you age, it is important to evaluate your driving skills. Can you see as well as you did before? Are you confused behind the wheel? Are you uncertain of what road signs mean or traffic signals? Can you slam on the brakes in an emergency? As hard as it may be to give up your keys, it may be a necessary step to stay safe. If you are still driving, be sure to wear your seatbelt at all times and obey all traffic signals. If you or someone you love has been injured in a car accident in Colorado Springs, you need an experienced car accident lawyer on your side from the very start. Contact the experienced Colorado Springs personal injury attorneys at the Green Law Firm today to schedule a no-obligation consultation and discuss your case. Call us today at 1-719-694-8515. By webadmin|2015-06-13T14:03:32+00:00June 2nd, 2015|Blog, Colorado, Colorado Springs, Personal Injury|Comments Off on Are Baby Boomers Taking Unnecessary Risks?